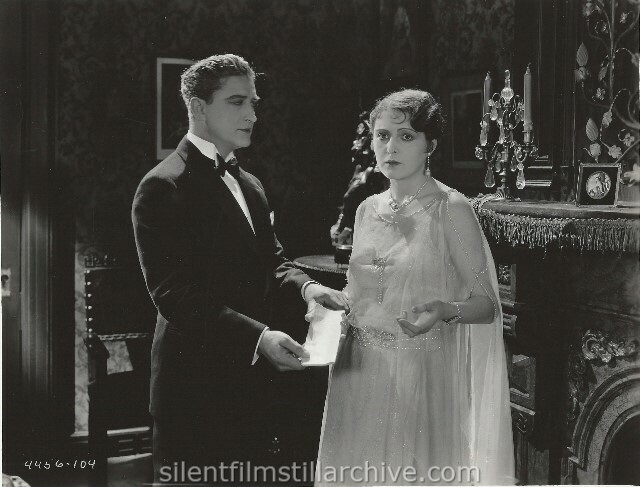 Francis X. Bushman and Billie Dove in The Marriage Clause (1926). Except where noted, all of our photos were scanned from original, vintage photographs issued by the studios when the film was released during the silent era. I've also included scans of original advertising flyers, lobby cards, and sheet music. Our film stills are in an alphabetical list by film title for easy searching. Check our performer list for stills of a particular actor or actress. Our publicity photo area has pictures of actors and actresses that are not tied to a particular film. I have furnished scans of these photos to documentary producers and magazines. If you need photos for your film or article, I can furnish high-quality scans or photographic copies. Because I want to promote silent film scholarship, your first few photos are free. Trying to identify a photo from a silent film? Have a photo from a silent film that you can't identify? If it has a code in the bottom corner, you might find it on our still codes list. I also have quite a few photos in my collection that I have not been able to identify. Click here to see if you can identify these performers and films. You can contact me by clicking on the feedback link, or by sending an e-mail to silentfilm at verizon dot net.